The rain and mist didn't dampen the spirits of students at Glendalough today. 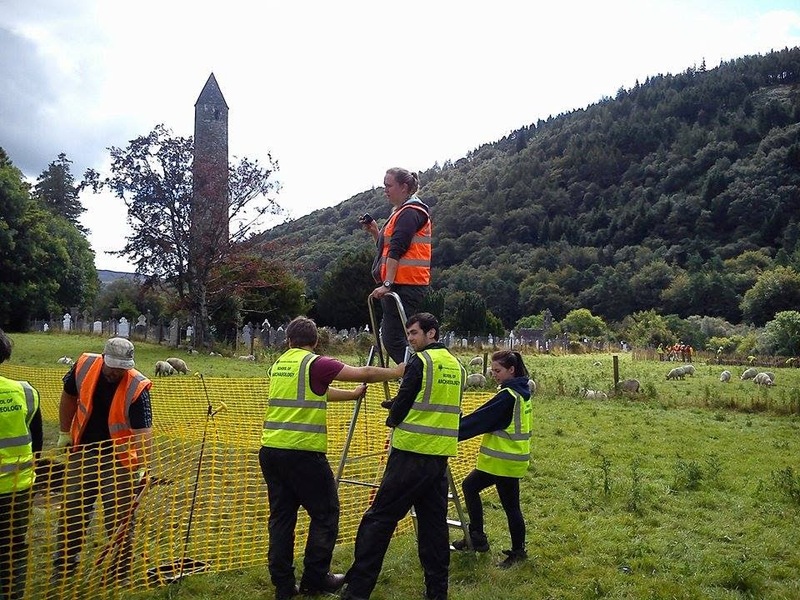 Today saw new groups getting the chance to excavate at the different trenches and others receiving the chance to take part in different surveying methods including: drawing survey which has been taken place beside Our Ladies church to the west of both trench 11 and 12, geophysical survey and digital survey this week. Weather throughout the day fluctuated between sun and rain with sun prevailing for most of the day. We had a large amount of rain towards the end of the day which luckily only took place as we were cleaning up. 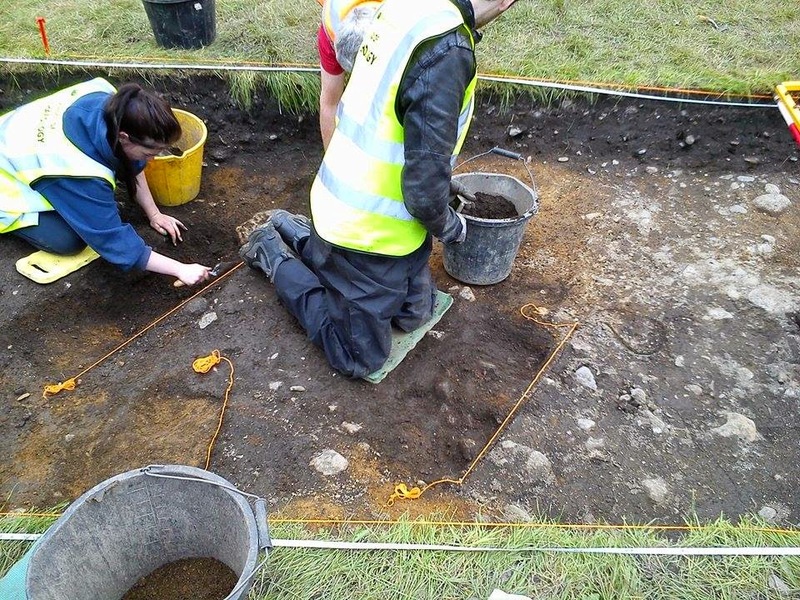 Trench 10 saw a new day of excavating and students got the opportunity to work along the pattern bank. For many it’s their first experience of an archaeological dig and the consensus is that their loving it despite their aching muscles from being on the hill. A sondage was opened on the western side of the trench and some more stones have been uncovered with this. The eastern side was brought down to a context just below the topsoil and work will continue on this tomorrow. Trenches 11 and 12 experienced an exciting day to those previously. Excavation of the eastern section of trench 12 revealed what appears to be a stone structure running north-west to south-east and then curving to the south. To the west of the wall a hearth is making an appearance with a large amount of burning and charcoal present around the area. Agricultural furrows continue to make an appearance to the west of the trench. A plan of these furrows was taken towards the end of the day which will make way for photography early tomorrow. The students had also been taken on a range of other activities with certain groups doing surveying, digital surveying and geophysics. Speaking with students we received nothing but positive comments about doing each different task. Trench 12 saw the appearance of less features today. Mattocking and troweling were undertaken earlier today with the rest of the day focusing on the contrasting colours of soil found throughout the trench. The main focus of the day was to better understand what each of these colours may have possibly meant. Finds from the trench included animal bone, medieval pottery and iron work. All in all day 4 saw the worst weather so far, which didn't hinder the performance of the students. Progress has increased dramatically on both trenches with a range of different discoveries coming from all three trenches. Hopefully tomorrow we can take these discoveries and elaborate on them and their uses.